Relentless Rejection Had to Stop! This post is my contribution to Faith Barista Bonnie Gray’s invitation to write about rejection – go to her blog to read posts from her and others. Rejection from anyone affects me. Thankfully not as much as it used to be, but I still try to avoid it. But there’s one person whose rejection affected me drastically in my life. This person used to be relentless! It seemed she was determined to make me feel bad no matter what I did. I was dammed if I did and dammed if I didn’t! She drove me nuts! Always making me feel like I wasn’t good enough. Always pointing to a place I hadn’t arrived at yet. Something had to change – I needed to avoid hearing her rejection or not believe it if I heard it. But, it was an odd paradox, because I couldn’t avoid her or stop her from talking to me, but yet I was the one giving her power. ‘She’ was that nagging voice in my head saying negative things to myself. And she could be so convincing that at times, I thought she was God’s voice telling me truth – ouch! But other times, I realized she was an unhealthy voice keeping me from living life to the fullest. and is all about love! Slowly I absorbed his love as I took time to learn about who he really is – not who religion/environment/culture has made him out to be. I have to/can/should love me – wow! And love and rejection can’t co-habituate – so one of them had to go. God’s love slowly quieted ‘her’ and if she manages to raise her ugly head now, I call on his spirit for help to drown her out. 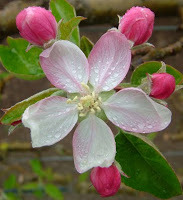 An apple blossom is gorgeous just as it is and it’s fully complete as a blossom. With time, the blossom becomes a bud – a beautiful bud, full of potential and fully complete as a bud. As the bud grows, an apple is formed. When the apple is ripe, it’s fully complete as an apple – ready to be enjoyed by one of us. 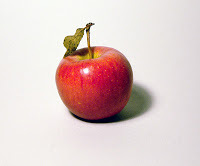 When I see a beautiful and delicious apple, I don’t fault it because it was once a blossom or bud. I realize it needed to be completely ‘there’ in order for it to ripen into an apple. So why do I fault myself instead of fully appreciating each stage of life I travel through? Now I aim to fully embrace where/who I am each day – with the understanding that I will probably move from this place to another one sometime. Fully embracing each day means ..
in every area of life – body, mind and spirit. *Yes, I know about the fall and sin entering the world, but I’m still created in the image of God and I don’t think his announcement of “It was very good” (Genesis 1:31) is erased. I live with an awareness that I can lean towards good or bad – it’s my choice. "So why do I fault myself instead of fully appreciating each stage of life I travel through?" That is so true for so many of us! Meanwhile, our Lord is quietly shouting "I love you. I love you. You are my perfect creation"
Wow. It's so true that we're nicer to others than we can be to ourselves. And, we tolerate things from ourselves that we would not accept from others. Thanks for the encouragement to embrace the stage I'm in. Excellent thoughts here, Janet. Thank you for sharing them. Thank you. I really needed to read this today. Oh. Yeah, I'm the worst of them all, aren't I? whoa…this hits home and I so do this too often to myself even still. thanks for the reminder! It's amazing how much we ALL do this to ourselves. It's scary how much it impacts us and it's stupid that we let it happen. A friend of mine once said something along the line of, "I don't understand how ANY Christian could EVER have any self esteem problems. He gave His life for us. What else could explain how valuable we are?! Hey Janet, this post surprised me — and blessed me. It is a lightbulb moment for me, too — that I need to love myself. I'm still learning to take this in & learn what it means in different areas of my life. I just read something about this yesterday; how the negativity within is stimulated by the actions of others, all due to our own low self-eteem because their actions rarely have anything to do with us, personally—it's all their stuff. You say it so well. It still hurts for a while, but with enough prayer the love inside blooms.